Mice have evolved beyond wireless models to include true in-air gyroscopic technology. 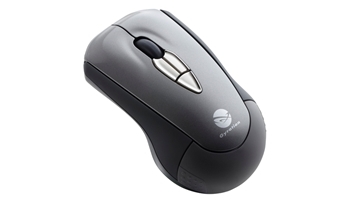 The Gyration Air Mouse Mobile combines the best of laser pointing, wireless mouse and gyroscopic air technologies to offer unprecedented value. Engineered to be the perfect mouse to go, the Air Mouse Mobile is designed for impromptu computing situations; while its 100ft wireless range and MotionSense technology make it an ideal controller for Keynote and PowerPoint presentations. Featuring a compact design, dockable receiver and gyroscopic gesture control technology, the Air Mouse Mobile is your perfect mouse to go--for laptop, desktop and presentation applications. Overall Dimensions: 5" x 7" x 2"